One can say pretty much about anything they like or dislike, it is just human nature. 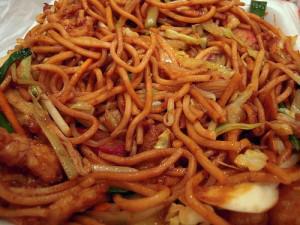 But than for this particular lo mein recipe I can`t think of any reason why would someone not like this recipe. If you are one of those people that don`t like this recipe I would really appreciate a few words from you in telling me why don`t you like it. It might just be the taste, texture, ingredients or just your experience. What ever it is please write something. Because I am a big fan of this lo mein recipe and I can`t find one negative point about it or maybe that is just me, which than again can hardly be true because pretty much all the people I know do love this lo mein recipe and everyone agrees it is a perfect healthy lunch idea. Cook spaghetti as directed on package, Al dente, drain,rinse in cold water, add a few drops oil and mix to keep from sticking. Slice steak VERY THIN, across the Grain, 2″ pieces. Mix together, steak, ginger, scallion, cornstarch, Sugar, light soy, set aside to marinate. When ready to cook, heat wok to smoking, add 2 tbs oil. Stir-fry Meat mixture two minutes, do not overcook, Reserve. Add 2 tbs oil, heat, stir-fry carrots and cabbage two minutes, add spaghetti, stir well and cook a few minutes, add Meat mixture, 1 tbsp soy and salt. Stir a minute to heat and serve.